You’re reading an article online. After a few seconds, you can’t remember what you’re reading and why. You’ve lost track. When we read someone else’s content, it’s easy to spot the friction. We stumble across a phrase. We misinterpret a reference. We get confused and reread a sentence. Or worse, we have to go back a few paragraphs to pick up the flow. Whenever that happens, the writer has failed to communicate with clarity. But how do you prevent readers from losing track? How do you keep readers engaged? When your chain gets muddy, it starts to squeak and rattle. Pedaling becomes harder. And perhaps the chain might even drop off. For a smooth riding experience, you first remove the dirt from your chain (my husband recommends the aptly named Muc Off), and then you apply lube to reduce friction and prevent rust. When editing your content, you do exactly the same. First you remove the dirt from your content—you eliminate wordiness and replace weak phrases. And then you apply writer’s lube—the transitional tricks for a smooth reading experience. Want to learn the 6 types of writer’s lube to reduce friction and keep readers engaged? Just like drops of oil make your bicycle chain move without friction, transitional words make readers glide through your content. You have ideas to share, but nobody listens. You’re asking for a sale, but you’re ignored. You want to inspire people, but everybody continues doing their own thing. Sometimes you want to shout HEY! YOU! LISTEN!!!! But you’d look like an idiot. And you know it wouldn’t work. How often you use transitional words, and whether you use them at the beginning or in the middle of a sentence, depends on the rhythm. Let’s look at the previous example again, but chop up the first three sentences. Read the example below aloud and you’ll notice it becomes a little too abrupt. You have ideas to share. But nobody listens. You’re asking for a sale. But you’re ignored. You want to inspire people. But everybody continues doing their own thing. It’s a little monotonous, right? Your writing requires a variation between long and short sentences. You have ideas to share. Nobody listens. You’re asking for a sale. You’re ignored. You want to inspire people. Everybody continues doing their own thing. You want to shout HEY! YOU! LISTEN!!!! You’d look like an idiot. You know it wouldn’t work. If you’re finding it hard to decide how to chop up your sentences, read content of other writers aloud or copy it by hand. Over time, you’ll internalize the rhythm and your writing will improve. Yep, just like in cycling, in writing you often move up or down a gear. Addressing your readers with short questions makes your content conversational and engaging, and you encourage your reader to read on. A few years ago, I bought a new bicycle. But each time I cycled uphill and changed gears, the chain fell off. Can you picture me? At the road side. Bike against a hedge. Hands black from muck and grease. To sort out this chain frustration, I now have a rubber dog fang. The dog fang prevents the chain from falling off. Legendary copywriter Joe Sugarman calls these transitional phrases seeds of curiosity. These phrases are especially effective at the end of a paragraph to encourage readers to start the next paragraph. Have you ever watched a comedian and wondered how he moved from jokes about his first love to politics and then on to Christmas dinners? The secret to moving from topic to topic without losing your readers or listeners are word connectors. Word connectors are words that are repeated in subsequent sentences. You see what I just did? I repeated the phrase “word connectors” to connect the two sentences together. This trick can be used anywhere in your writing, but is particularly useful for metaphors. Note how the repetition of the word “mini-skills” helps transition the reader from cooking to writing. A coke quenches your thirst and appears to give energy, but its nutritional value is low. A fruit smoothie sounds healthy, but may have a ton of added sweeteners. Words with low nutritional value are similar. They seem to have a meaning, but their meaning is weak. Repeating a variation of the phrase “low nutritional value” helps readers move to the next topic. Pronouns (words like they, it, he, her) play a similar role as word connectors, but you have to be careful what or whom the pronoun refers to. In the example below, the reader doesn’t know whose ice cream I’m referring to. The kid was angry with her mother because of her ice cream. The kid was angry because she had only one scoop of ice cream, and her mother took three scoops. Ambiguity confuses readers and makes them stop to consider your message. And as soon as readers stop, they consider clicking away, too. Take away ambiguity, and readers glide through your text. Effortlessly. Bicyclists can argue for hours about the best way to keep your bike chain free from rust. Use WD-40. Use Tri-flow. Use light oil. Re-lube more often. But your content requires a mix of tricks for the smoothest reading experience. And you know the strongest lube to keep your readers hooked? That’s the use of seductive subheads. Make sure your subheads arouse curiosity or promise a benefit for reading on. And if you’re explaining a series of tips or tricks, then number your subheads to provide a cue to readers where they are in your content. When your reader’s mind starts to wander off, a seductive subhead entices him back. It encourages people to keep reading, and helps them move to the next topic without friction. 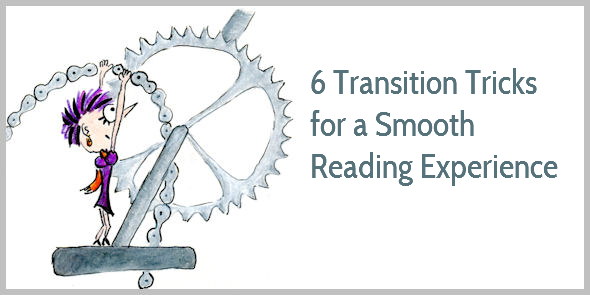 Creating a smooth reading experience requires a singular and obsessive focus. Empathize with your readers, and understand which squeaks and rattles are slowing them down. Take away ambiguity, and eliminate confusion. Read your content through your reader’s eyes, and spend more time editing your content. Make the flow of your words as smooth as a brand-new bicycle chain. But I’m confused – you say Greetings from sunny England . . .
And just yesterday you were in Penang . . . I can’t keep up with you!! Seriously, most enjoyable reading your posts. Thank you for stopping by, Tony. This was a wonderful post. I always had this issue. I myself would lose track when I read my own posts. The thing is I did not know this is a problem or if there was a solution for it. When reading through your post, after every para I felt oh see this particular trick can work with my problem. I think using connecting words and drops of light oil can do wonders. It’s amazing how you start noticing certain writing techniques everywhere once you’ve learned about them. Henneke, I really enjoyed reading this post–it was like we were riding our bikes through the countryside, chatting in a conversational, care-free way. I always enjoy metaphors that are appropriate to the content, because I start to wonder how the writer is going to make various comparisons–are they corny or do they make sense. Your bicycle chain metaphor hit the target beautifully. What’s more, the article was packed with practical information. Thank you for another wonderful post. Now we’re getting into the finer points. This is advice with high nutritional value indeed. I may need to go back a re-read this article often until it becomes second nature. Yep, the finer points. But they make a big difference. Smoothening the transitions is one of my most important editing jobs. Yes, well, editing is the biggest part of writing, no? David Ogilvy said: “I am a lousy copywriter, but I am a good editor. So I go to work editing my own draft.” I guess he’d agree with us that editing is the biggest part of writing. I guess that’s another way to put it. I like that quote! Thank you for sharing. I didn’t know it yet. I’m glad it’s not just me with the colons! That’s an awesome post once again, as always! I do come across such friction from time to time with my own writing. I realize it when I write a blog post. Connectors, the oil – great examples and I am sure these will help me next time when I’m stuck like that. Great! Glad to hear you found the post helpful. Solid post. You are right, sometimes I read a post and three paragraphs down I can’t recall what the writer said in d past paragraph. This is definitely not good and I often worry that my writing might come off this way. Glad to hear you found this useful, Chioma! If you want to check how smooth your writing is, then it can help to leave it for a couple of days, and then read it aloud with fresh eyes. This always helps me spot tiny problems that I didn’t see in first instance. I love reading your answers to comments. Short, spiffy sentences. Or sequential phrases separated by commas. Definitely the feel of a well-oiled bicycle chain. Thanks, and enjoy your sunny days. Thank you for your compliment and for stopping by, Ken. You got a nice rhythm in your comment, too. I really like number 2. It makes your writing more conversational, as you pointed out. What makes it work? It adds another hook to keep your reader paying attention. I still wonder this, even when I am watching for the connections. There is a real art to using word connectors. I’m a Toastmaster in my spare time, and I find it pays to watch videos of good speeches and then reverse-engineer them to see why they pack such a punch. The same applies to good writing (like yours!) It’s well worth picking through the parargraphs to see what makes them so gripping. By the way, reverse-engineering is how I learned to write as well. I studied how others write (especially people whose writing I like). And I still try to do this to continue improving my writing (and drawing!). You’re posts are always so informative. And you explain things in such a fun, engaging way. Today I learned a new word. Smoothen. I had to look that up, just to be sure. Either it’s not commonly used in American English, or I need to read more. And I had to Google “rubber dog fang”. I had no idea. But, I came back. You didn’t lose me. I don’t know how you come up with such great ideas for posts. So much of what you write seems obvious. Simple tips that we use occasionally without thinking. Reading a post like this brings the transitions into the conscious and forces me to think about them. I’m glad you came back to finish reading the post. Perhaps I should have added a picture of a rubber dog fang to explain it. I don’t know about smoothen. It showed up in my dictionary. But, I hadn’t heard it before. Yes, I would use smooth as the verb. That doesn’t mean I’m right. ? Of course I came back. I read and re read your posts. Today I was distracted by thoughts of cleaning a bike chain, wondering if it should be cleaned before it’s oiled, or if a spray will clean and lube at the same time. Scatterbrained. I trust your advice on smoothen. I’ll change it in the text. Thank you, Scott. I looked it up before publishing. It’s in Merriam Webster’s. To smoothen means to become smooth or to make smooth. It wasn’t marked as chiefly British English, so I guessed it would be okay. But it’s clearly confusing for American ears, so I’ll change it. Thank you for pointing it out! I appreciate it. Love your post. I always learn lots but this time it really hit me. I thought I knew lots about transitions but you really open my eyes to some new ideas. You’re welcome, Wendy. I’ve noticed that most people use transitions quite intuitively, but when they pay a little more attention to transitions, they can make their writing even smoother. And it makes a real difference to the rhythm of their writing. Rhythm in writing doesn’t get enough attention. You were talking directly to me. I’ve read blogs where I wander off or had to go back and re-read sentences all over again to get the point. Then I ask myself if I write like this. I tell that these are some great tips to follow. I will definitely have to bookmark this for my own sake! Hey Henneke, another fantastic post that teaches me so very much as a budding solutions generator aka copywriter. Thanks, printed it and will study it with the rest of the outstanding info. PS I sold my Gazelle bike when I left for the US. Boy, I still regret that, oh well, it is what it is. Thank you, Elvire. I can imagine you’re missing your Gazelle. Time to buy another bike? Great value once again, still learning from you happily reading taking it in, no pressure only better writing and a course on Dog Psychology. I learned to love what I do. Love A. Thank you, Annamarie. I feel lucky to love what I do, too. Usual gold Henneke. Thanks again. Wow, Henneke, once again an awesome post. I was so inspired when I read it, I had to share it on Twitter and Google+, just in case people missed it. I do believe this advice will stick after I leave this page. Thanks Henneke. One thing that helps is reading copy out loud. Its amazing what your eyes read vs. what your ears hear. Its a great way to edit. This is really superb. Creating engaging contents is never easy but once it becomes part you, you will always find it fun. Its always good to see look and read or articles using our readers eyes because this is the best way we will be able to spot some flaws on the article that we might not have noticed initially. I love this post mam, thanks for sharing. Glad you enjoyed it, Theodore. Thank you for stopping by! More great tips! Thanks as always! Absolutely remarkable post. My goodness, I need to really practice writing and using analogies and stories like you do .. because the bike example tied in beautifully with the theme of the post. It really helped me out. I really love the changing gears and dog fang tips. Thanks for the practical tips and for always being so thorough. I enjoyed reading this. As well as the other articles you have posted. I have just begun writing in the marketing industry and I was having a hard time. Your tips helped correct a lot of things I thought I was doing right. Thank you so much for sharing these goodies! Thanks for highlighting the importance of transition words. Your examples have made it crystal clear. I feel so refreshed when I read your AMAZING content. The way you explain techniques of writing with examples is so helpful. Thank you for your lovely comment, Arfa. And yep, transition words play quite a big role in creating a smooth reading experience. The idea of a bicycle riding metaphor works well, does it not? Particularly the oil – used sparingly. And, as usual, it’s your pictures that do it for me J It’s taken me a while to visit your blog (having followed you on Twitter for some time). Interesting for me, because now I realise there may well be truth in all these claims that one needs however many ‘touches’ before a ‘sale’. It’s also been a while since I’ve been using cycling metaphors, so perhaps it’s time to exercise my metaphoric muscles again! I’m absolutely in love with your writing skills. I really love the way you have put up all experience you’ve had. I found your articles very helpful. Yet I would like you to please give me some tips on how to start writing a book. The person who writes is called writer or author. But I’m the other guy who has a self-drafted story which I want to write by self. In short, I want my story to be published as my own (As Written by Laxman) without having hired an outside editors. So please share some tips. You don’t have to call yourself a writer or author to write a book. Anyone with ideas to share can write a book. PS You can hire outside editors without having to put their names on your book. If you’d wanted to, you can even hire a ghostwriter without having to put their name on your book. Love it, Henneke . You’re the Master of Metaphors. Thanks for posting this article. You helped me with transitions on my book critique. This article is very informative. I will try to use these tricks in my writing, and I am keeping this article with me for reading it on and off. Thanks, Muhammad. I’m glad you enjoyed it. Happy writing! Thank you, Kelly. Happy writing!